choir croak out them goodies: Good Throb gives you a good shake! Good Throb gives you a good shake! London's Good Throb might be better at punk than half of its originators; thanks largely to frontlady KY Ellie, they boast a vicious delivery that seems to be missing in a good lot of American bands that give it a go. They've got the desperation that only comes with needing to spit something out urgently, and they've got the balls that post-punk acts like French Vanilla are so unfortunately lacking. This is what happens when a lyricist might have a sharp sense of humor but doesn't feel the need to hide behind it. Ellie firmly says, "Give me validation" the way Poison Girls' Vi Subversa would say, "Now I feel just like my mother/her price is low," or Eve Libertine would say, "You take what you want when you want it." And they've come so, so far since 2013. 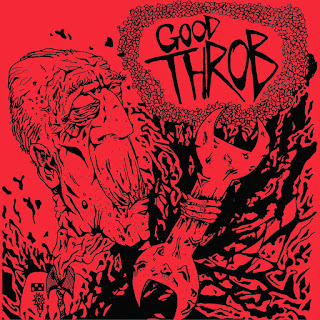 Good Throb is being very kind and offering their music for free. Be kind in return and purchase it.